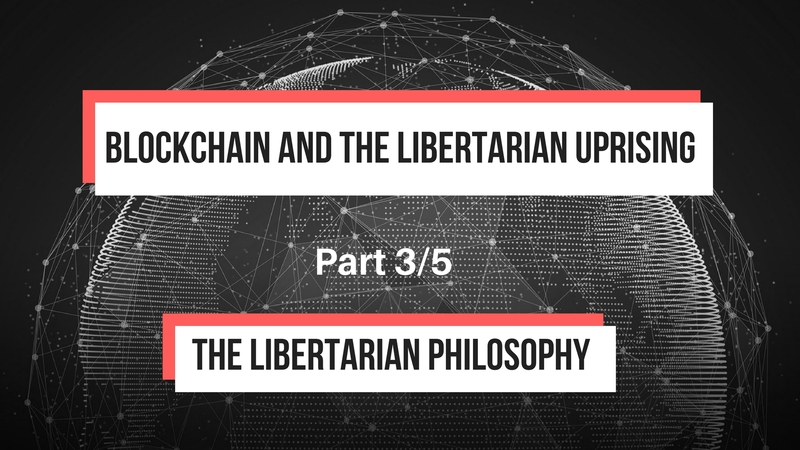 This is part 3 of a 5 part series adapted in blog format from my senior research paper titled “Blockchain and the Libertarian Uprising“. Any argument claiming the fulfillment of a political philosophy must first define the tenets of such a philosophy. Additionally, in 2014, PEW research revealed that one in ten Americans identified as libertarian yet nearly 45% of respondents failed to identify elements of the libertarian ideology from a multiple choice list (Source). Libertarianism is not characterized by a single viewpoint. Libertarians range from anarcho-capitalists who advocate the elimination of the state in favor of a free market to libertarian socialists who are anti-capitalist and would prefer to merely decentralize government (Source; Source; Source). However, all Libertarians are united by a belief in individual liberty, economic freedom, and government skepticism (Source). Libertarians hold that the basic unit of analysis in a society is the individual (Source). “Only individuals make choices and are responsible for their actions” (Source). All individuals have a right to life liberty and property. These rights are not given to them by government but are inherent to being a human being (Source). While order is necessary for individuals to survive and thrive in a society, order does not necessarily need to be imposed by a central authority (Source). “The great insight of libertarian social analysis is that order in society arises spontaneously, out of the actions of thousands or millions of individuals who coordinate their actions with those of others in order to achieve their purposes” (Source). By this view, the natural comings and goings of individuals acting interdependently with one another fosters a natural order that is sufficient for individuals to thrive in. Libertarianism does not advocate that individuals act however they wish and that nobody should be able to intervene. Rather, they propose a society of liberty under law (Source). Individuals may pursue their own lives however they intend so long as they do not impede the equal rights others. “The rule of law means that individuals are governed by generally applicable and spontaneously developed legal rules, not by arbitrary commands; and that those rules should protect the freedom of individuals to pursue happiness in their own ways, not aim at any particular result or outcome” (Source). “Power tends to corrupt and absolute power corrupts absolutely.” These words by Lord Acton are dearly held by libertarians who wish to decentralize and limit government. Usually, this is accomplished by a written constitution that narrowly defines the powers and duties of a government as granted by its people. A government is granted power by its people and people should never fear their government (Source). The right to property includes the right of individuals to exchange any property by mutual agreement. Libertarians believe that people will be more free and prosperous if governments minimize their intervention in individual’s economic choices (Source). The bulk of libertarian thought began in reaction to seventeenth-century monarchs and aristocrats who made their wealth from the productive labor of “lower class” individuals (Source). Libertarians hold that there is immense dignity in labor and that producers are entitled to the right to keep the fruits of their labor. Thomas Jefferson said in 1824, “We have more machinery of government than is necessary, too many parasites living on the labor of the industrious.” Today, libertarians see a new class of bureaucrats robbing the middle class through taxes and giving the wealth to non-producers (Source). Libertarians believe that in a peaceful and just society, the individual’s interests have a natural harmony with others in the society. The market may deem an individual’s interests unfeasible and so that individual must adapt, yet still there is harmony. It is only when governments begin to offer handouts to specific parties based on political pressures that conflicts of interest arise and people begin to behave in unjust ways. “Throughout history, war has usually been the common enemy of peaceful, productive people on all sides of the conflict” (Source). Libertarians recognize that conflict and war never benefit the common people and almost always benefit the elite in a society. As David Boaz recognizes, these values tend to encompass the span of modern political thought in the western world. Libertarianism is not just a collection of these broad principles, it strives to apply them to the fullest extent, more radically than modern thinkers and governments intend. However, every day new exceptions to these principles are being made by Washington and Wall Street alike that threaten individual rights on every level.